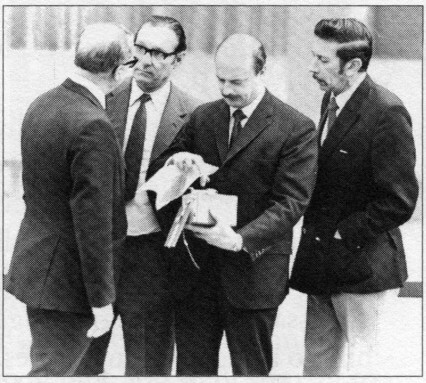 Eric Morley, the creator of Miss World, noting down some important vital statistics. 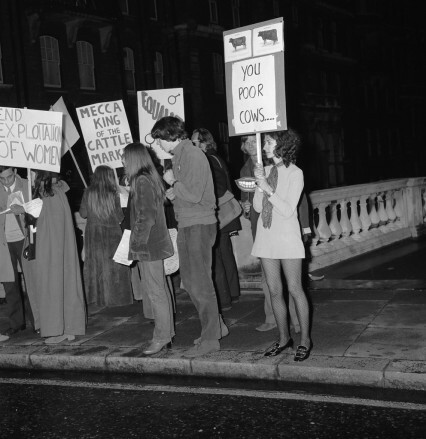 There were two separate protests at the Royal Albert Hall on 20 November 1970. One of them, the iconic flour-bomb demonstration directed at the Miss World contest by a group of young feminists, has become part of popular social history. The second, a potentially more serious event (something similar would certainly be taken as such today), has almost been completely forgotten. At around 2.30am, on the morning of the Miss World contest, a group of about four or five young people had gathered around one of the BBC’s outside broadcast lorries that had been parked at the side of the Royal Albert Hall. They slid a home-made bomb under one lorry and ran off quickly down Kensington Gore in the direction of Notting Hill. A small amount of TNT, wrapped in a copy of The Times, exploded a few minutes later waking up residents in a nearby block of flats, one of whom saw the youths running away. 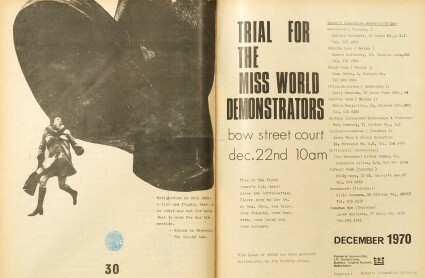 The small explosion was mentioned in the press the following day but it didn’t compare to the huge publicity the women’s liberation demonstration garnered, not least because of the unbelievable popularity of Miss World at the time. The 1970 contest, in the UK alone, had almost 24 million viewers – the highest rated television programme that year. It was in the middle of the contest when about fifty women and a few men started throwing flour bombs, stink bombs, ink bombs and leaflets at the stage wile yelling “we are liberationists!”, “We’re not beautiful, we’re not ugly, we’re angry” and “ban this disgraceful cattle market!”. The whole world took notice. "Resignation is only abdication and flight, there is no other way out for women than to work for her liberation." Bob Hope, who was to crown Miss World and was performing when the protest started, certainly noticed and he quickly tried to flee the stage as the missiles flew by. He was hampered by Julia Morley, the wife of the organiser Eric Morley, who grabbed hold of his ankle in a desperate attempt to stop him leaving. 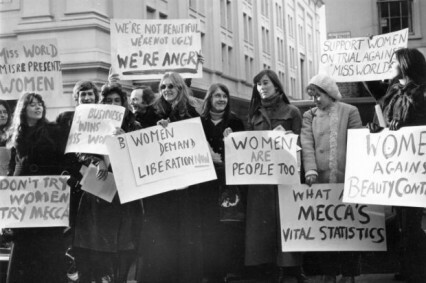 It only took a few minutes for the police to restore order but the women’s movement had in one fell swoop established itself as part of the seventies. These things can’t go on much longer. They’re going to have to get paid off sooner or later. Someone upstairs will see to that. Anybody who wants to interrupt something as beautiful as this must be on some kind of dope. The world’s most famous beauty contest had started just twenty years previously in 1951 when an ex-squadron leader called Phipps was in charge of publicity for the upcoming Festival of Britain. He rang a former RAF friend, who was now running a catering and dancehall company called Mecca, asking for ways to add some “razzamatazz” to the rather sedate festival plans. He was quickly told “My man Morley will come up with something”. A few days later, over lunch at the Savoy, Eric Morley, who was already responsible for coming up with ‘Come Dancing’ for the BBC in 1949 and went on to popularise Bingo, suggested a ‘Miss World Festival Bikini Girl contest’. It went ahead and become a huge hit – a Swedish woman called Kiki Hakansson won the first prize of £1000. Girls between 17 and 25, ideally five foot seven, eight or nine stone, waist 22-24″, hips 35-36″, no more no less, a lovely face, good teeth, plenty of hair, and perfectly shaped legs from front and back – carefully checked for such defects as slightly knocked knees. Just ten days later another bomb exploded at the London home of the Attorney General, Sir Peter Rawlinson in Chelsea. Another ‘communique’ was released obviously from the same source as the commissioner’s bomb but this time signed by The Wild Bunch. The young anarchists that were responsible for the bombings were utterly confused with the lack of publicity so far. They assumed, almost certainly correctly, that there was a conspiracy of silence on behalf of the establishment in case urban guerilla activity became fashionable. 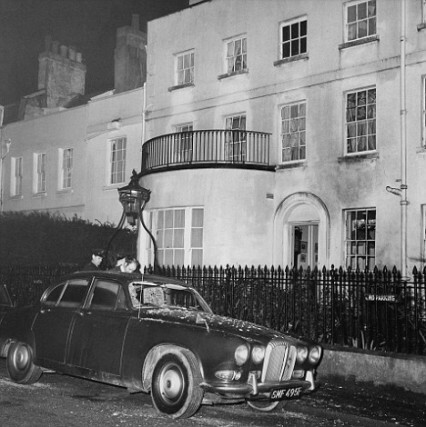 On 4 December 1970, just two weeks after the Miss World bomb, a car drove around Belgrave Square and machine-gunned the Spanish Embassy. 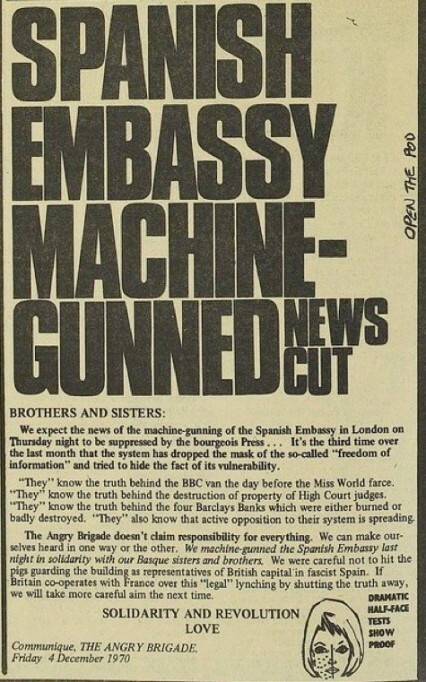 The young student militants again found there was nothing in the papers after the attack and still suspecting an establishment conspiracy they decided to issue more Communiques to the underground press and for the first time they were signed ‘The Angry Brigade’. The International Times December 1970, does anyone know what the 'Dramatic Half-Face' graphic means? The name was thought up after a drunken Christmas party and may have came from the ‘We Are Angry’ placards at the Miss World protest. 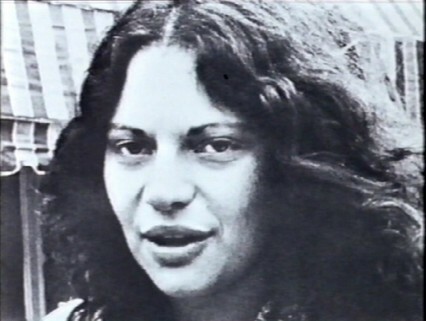 Although Stuart Christie, an anarchist and connected with The Angry Brigade, later wrote that they had toyed with the name ‘The Red Rankers’ in deference to the speech defect of the former Home Secretary ‘Woy’ Jenkins. So far the relatively unreported bombing campaign had utterly mystified the police. They were completely confused as to who the perpetrators were but they successfully managed to keep the bombs and the shootings relatively under-reported (the Miss World bomb was an exception). The situation immediately changed when on January 12 1971 a bomb exploded at the home of the Right Honourable Robert Carr, Secretary of State for Employment (and chief advocate of the hated (by many) anti-union Industrial Relations Bill). The Angry Brigade released another of their communiques stamped with the distinctive children’s John Bull printing set, and, with this particular incident too serious to be brushed under the establishment’s carpet, the Angry Brigade suddenly found that they had reached the nation’s consciousness. `If you’re not busy being born you’re busy buying’. All the sales girls in the flash boutiques are made to dress the same and have the same make-up, representing the 1940′s. In fashion as in everything else, capitalism can only go backwards — they’ve nowhere to go — they’re dead. Miss Selfridge girls dressed and made up the same and no doubt contemplating that capitalism can only go backwards. 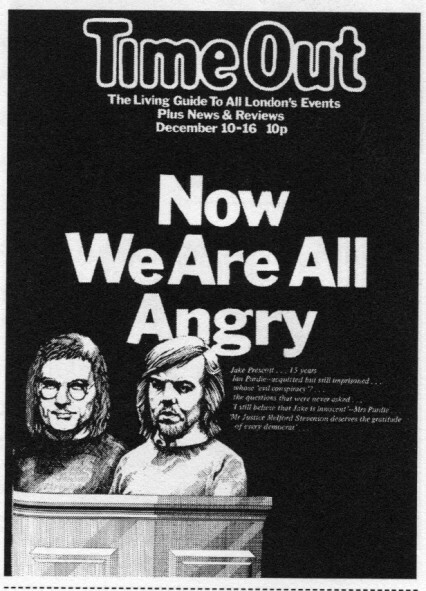 A few months after the Biba bombing the police raided a house at one end of Amhurst Road in Stoke Newington where they found various explosives, ammunition and guns but most damning of all a John Bull printing kit with the words ‘Angry Brigade’ , rather incriminatingly, still set out. The police soon arrested eight supposed members of the Brigade and they quickly became known, rather imaginatively by the press, as the ‘Stoke Newington Eight’. 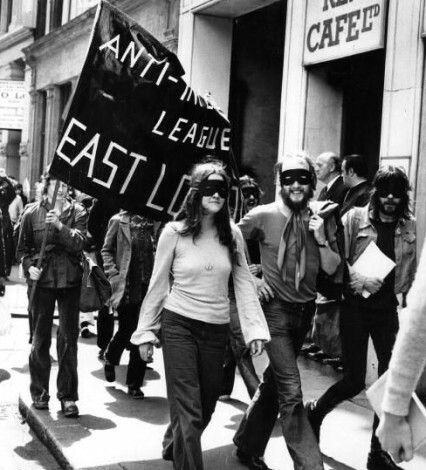 The Angry Brigade’s campaign came to a definite end after the longest criminal trial in English history (it lasted from May 30 to December 6 1972) – they were accused of carrying out 25 attacks on government buildings, embassies, corporations and the homes of Ministers between 1967 and 1971. At the end of the trial a majority verdict of guilty for conspiracy ‘with persons unknown’ meant that four of the defendants, John Barker, Jim Greenfield, Hilary Creek and Anna Mendleson each received prison sentences of ten years despite the jury’s request for clemency. It was difficult for the jury to deliver anything but guilty verdicts after the judge Mr Justice James explained that active participation was irrelevant; mere knowledge, even “by a wink or a nod”, was sufficient proof of guilt. He went on to describe the Angry Brigade politics as ‘a warped understanding of sociology’. 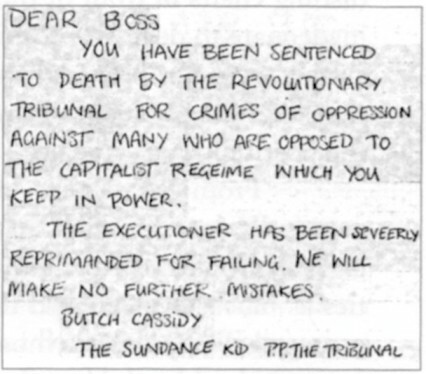 Other defendants, however, were found not guilty including Stuart Christie, who had formerly been imprisoned in Spain for carrying explosives with the intent to assassinate the dictator Franco, and Angela Mason, who went on to become the director of Stonewall and the Government’s Women and Equality Unit and who was awarded an OBE in 1999. 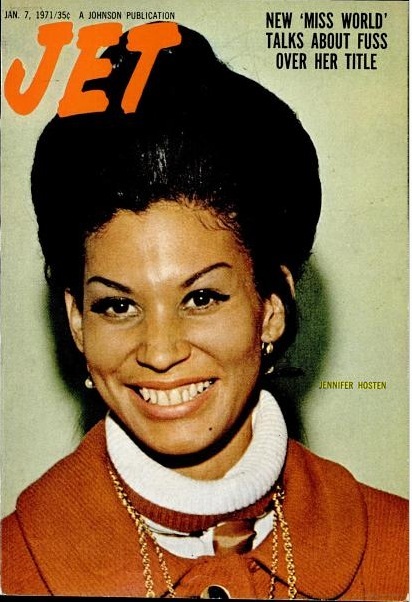 Receiving a $1200 tiara and $6000 in cash for her troubles, it was the 22 year old Miss Grenada, Jennifer Hosten, who eventually became Miss World and the first black winner of the contest in 1970. In fact it another black contestant – Miss Africa South, a Pearl Gladys Jensen – came second. Miss Africa South isn’t a typo by the way, that year Eric Morley, hoping to placate the growing disquiet about apartheid South Africa, decided he would admit to the contest a black and a white contestant from the country. Jillian Elizabeth Jessup, the white South African, and who was allowed the sash with the real name of her country, came fifth. I was wrong when I said there was two separate protests at the Royal Albert Hall forty years ago. There was also a third, but this time it wasn’t about the exploitation of women but a collective disapproval of the result. 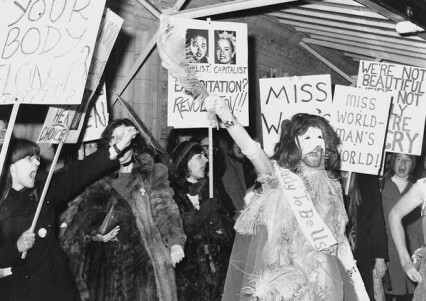 After the Miss World contest had come to an end many of the audience gathered outside the Royal Albert Hall to protest and started chanting ‘Swe-den, Swe-den’. The BBC also received numerous protests with accusations that the contest had been rigged. Four of the judges, it later came to light, had given first place to the Swedish entrant, a twenty year old model called Maj Christel Johansson, although, rather oddly, she came only fourth overall. However Miss Grenada, the eventual victor, only got two first place votes from the judges. Was it more than a coincidence that one of the judges, a Sir Eric Gairy, was the premier of Grenada? Had he influenced the other judges who incidentally included Joan Collins and Glen Campbell? The judges of Miss World 1970 including Sir Eric Gairy. 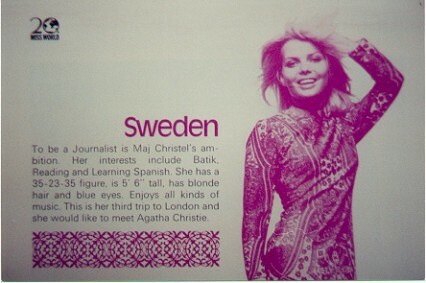 I wonder if Maj ever got to meet Agatha Christie? I suspect not. I don’t even want to win. I was warned the contest was like a cattle market and I’m inclined to agree. I feel just like a puppet. I do not really know enough about what they were demonstrating against, all I know is that it has been a wonderful experience competing for the Miss World title. 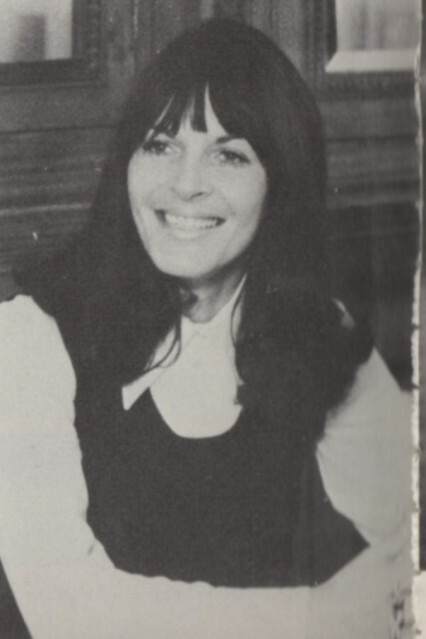 Four days after the contest, Julia Morley, although insisting that no vote-rigging had occurred, resigned from her post as organising director of Miss World after intense pressure from the British press. Luckily her husband ran the Miss World organisation and, after the fuss had died down, she was reinstated a few days later. If all this anarchist and feminist politics is a bit much. 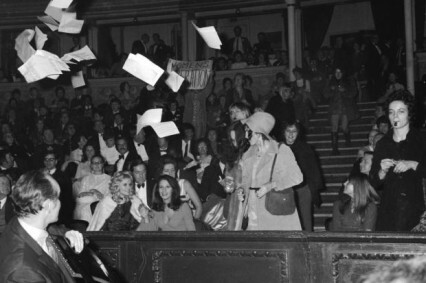 Here’s Lionel Blair and his dancers opening the Miss World show at the Royal Albert Hall 20th November 1970, without a protest in sight; although almost certainly there should have been. Finally, in case you want to know, Jennifer Hosten’s vital statistics were 36-24-38, which meant that her hips were two inches larger than Eric Morley’s ideal Miss World shape. He probably wished she was wearing a bikini. Because they have been largely forgotten this Angry Brigade chronology is absolutely extraordinary.